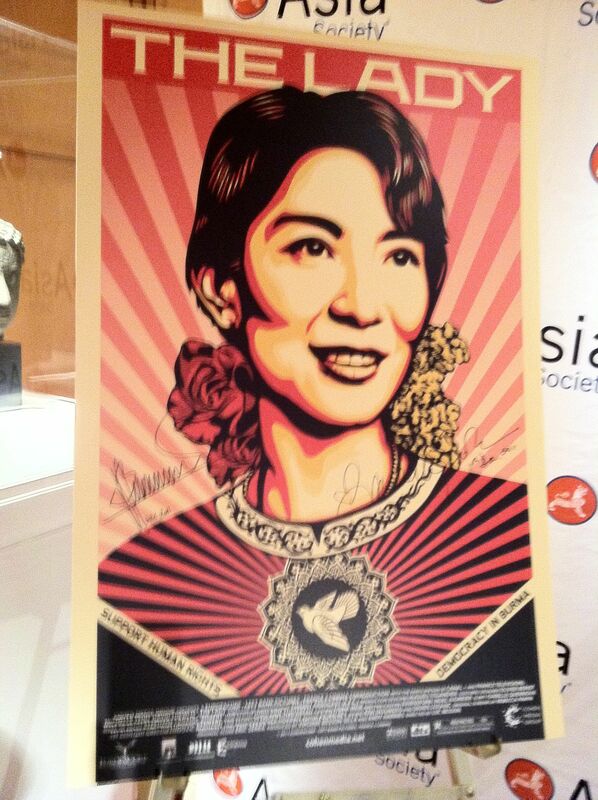 French Director, Luc Bresson, (Le Femme Nikita, Fifth Element) and Actress, Michelle Yeoh, (Crouching Tiger Hidden Dragon), were on hand at New York’s Asia Society to screen their film, The Lady, on Burmese Leader, Aung San Suu Kyi. The film starts with the assassination of Suu Kyis’ father, Aung San, the Burmese democratic leader who ushered in independence from British rule in 1947, the same year he was killed. It picks up again after she has moved to Oxford, where she lives with her husband and Burmese scholar, Michael Aris, well played by David Thewlis, and their two children. Kyi returns to Rangoon in the early 90’s to care for her ailing mother and bears witness to the violent student crackdown by the military. She doesn’t leave, and with almost two decades of house arrest and a Nobel Peace Prize, as the saying goes, the rest is history. The crux of the film centers on the pull between Suu Kyi’s choice to lead her country over choosing to raise her family in Oxford. Her choice resulted in her not being with her husband on his death bed from prostate cancer in 1999. If she left Burma, she would never be allowed to return, and the military junta denied Aris’s visa from London. Aris forbade her to leave. Besson does his best to stick to the riveting facts of her story. A Burmese reporter at the post-screening asked why he only focused on the Hollywood-version of her marriage and not the atrocities still inflicted on the Burmese people by the military junta. Besson said he couldn’t tell that story because he didn’t know it that well, but wanted to focus on the inner conflict within Suu Kyi, and deal with the love of family and country. It is an effective strategy, and Suu Kyi is wonderfully played by Yeoh. She embodies the Burmese leader with steely grace and dignity that has earned Suu Kyi the adoration of the her nation and beyond. Another Besson strategy that anchors the film is that many of the smaller roles were filled with Burmese non-actors. Filmed in Thailand, the Thai border has a large Burmese refugee camp and over 200 residents from the camps were used. Suu Kyi’s housekeeper and menacing military guard that keeps her under house arrest are deeply effective. Besson said the despotic guard who keeps her confined under house arrest is actually a carpenter by day. He was quite brilliant. The story lapses into sentimentality but it does make the viewer, especially this one, to want to learn more about Suu Kyi, the history of Burma, and the current situation. Not a bad result for a Hollywood film. The Lady will be released in February, and by all means, rent it, download it, pirate it (if you live in Burma because it is illegal there), just make sure you see it. Although Hillary Clinton was able to visit Suu Kyi this year, and Suu Kyi’s house arrest has been lifted, Besson and Yeoh are cautiously optimistic about her future. “Her release from house arrest has happened before, but people are still getting killed at the borders,” he said. To see the full interview, please visit the Asia Society website. Can’t see it on Vimeo? Watch it on YouTube.